Boiled chickpeas in the fridge is a great convenience always. It can be made into a curry with mixing whatever vegetables one finds in the fridge if needed but my motive always is to be able to get a nice filling salad without much effort. While I do believe in slow cooked warm meals, I feel it is equally important to get filling nourishing meals even if one is strapped for time. Chickpeas make sense on both counts as they are slow cooked from scratch by soaking dry chickpeas and then cooking them till soft. After this the refrigerated cooked chickpeas can make an instant meal by combining a few more ingredients. Chickpea salads have been my go to meals many times. 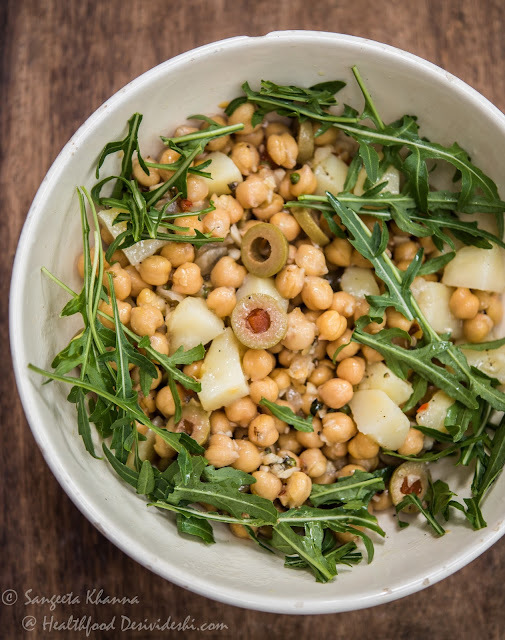 This chickpea salad is made with refrigerated boiled potatoes, and some olives along with rucola from the garden. One can add fresh mint or coriander leaves or whatever is available. The most interesting part of this salad is the green peppercorn salad dressing that can be made and bottled for a couple of weeks together. This dressing can even be made to last a year with minor adjustments in ingredients. 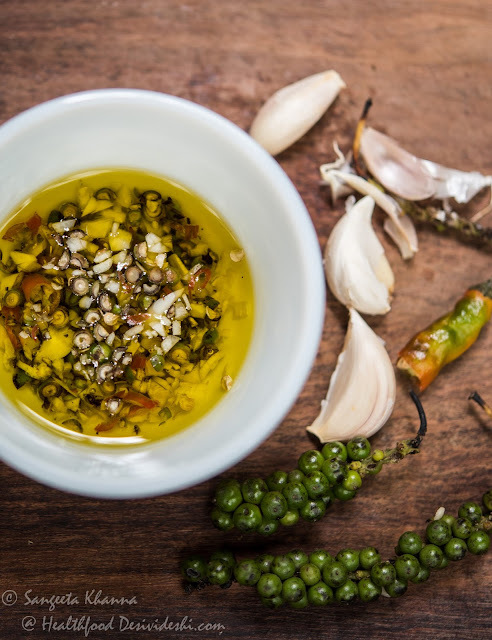 This is one salad dressing that packs a hot punch. Green peppers are not very easy to come by but whenever you get them you can make a batch. If you don't have any chance of getting green peppers you can soak black peppers in water overnight, crush them lightly in the morning and make the dressing using that. The green peppercorns impart a fresh flavour though. Mix everything together and fill into a glass jar. Use as required. Toss everything together, adjust seasoning and serve. This salad tastes great at room temperature and stays well for 5-6 hours at room temperature so it is a great choice for lunch boxes too. You can add some diced cucumbers to the salad to add more texture. I avoid tomatoes with this dressing normally but you can go ahead and add those too if you wish. Earlier last month we were visiting a coffee estate where I am working on the menu and food for their upcoming resort. I will share more information later but the pepper vines at the estate were a delight to see. We clicked some birds perching on those vines and wondered if they eat the hot peppercorns. I was reminded of this green pepper salad dressing when I saw the pepper vines growing luxuriously at the coffee estate that is located in Palani hills of the southern state Tamilnadu. Few months ago I had procured green peppers with great difficulty for a photography project and had made the dressing in bulk with the leftover green peppers. I had been using the dressing in so many ways too but never got around to sharing it here. Green peppers are easily available in some places as I have seen them being sold by the kilo in Chennai markets a few years ago. 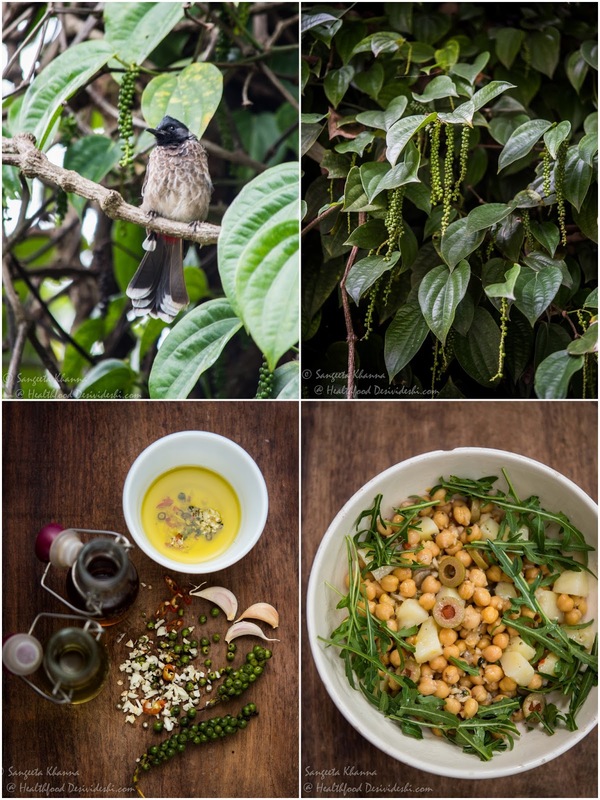 Make good use of the green peppercorns if you find them easily. I will share an easy pickled green peppers too and that pickle can also be used to make salad dressing and can be added to salads as an ingredient too. If you sun dry the mature green peppercorns they become black peppercorns. That looks yumm .. but wont it be a bit hot with the hot peppercorns in .. It is not hot as it has vinegar too to neutralise the heat to a large extent. Thank you Bikram.